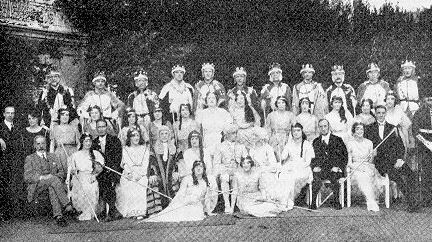 The next production, in May, 1924, was 'Iolanthe', which was put into rehearsal after the unusual course of taking a vote from the audience at the previous show. Due to various causes, chiefly the difficulty in filling the men's parts, it had never previously been undertaken. The audiences seem to have received it warmly, however, and the critic of the Letchworth 'Citizen' was moved to write: 'What Struck me most about the Thespians. In November of the same year came the third production of 'The Gondoliers.' Mr Edgar Wilby being unable to spare time for rehearsals of the show because of other engagements, his place was taken by Mr R. H. O. Wright, who was to remain the Society's Musical Director until 1952. Mr Symmons has a story to tell of this production. The following May, the Thespians broke away once more from Gilbert & Sullivan with their production of Edward German's 'Merrie England'. Mr Sharman, who had produced nearly every show until this date, decided to hand over to a professional producer and Mr Sydney Rendell was engaged. This was also the first appearance of his wife Eisie, who came to help with the dancing, and who was to remain closely associated with the Society for nearly forty years. It was after this production that negotiations were begun with the Customs & Excise authorities, with a view to obtaining exemption from Entertainments Tax. Among the stipulations made by the authorities was that which required a certain percentage of total takings to be given to charity. To show the necessary balance on the accounts of this performance, an appeal was made to some good friends of the Society to become Patrons, and the number of these has increased with the years. In the autumn of 1925, the Thespians again returned to Gilbert & Sullivan, putting on 'The Yeomen of the Guard' for the fourth time. The production was in the hands of Eisie Rendell' 'whose energy and marvellous vitality', wrote Mr Sharman later, 'have put new life into the Society and won the hearts of all who have had the privilege of working with her or under her.' Certainly she was much-loved by the Thespians, remaining their loyal friend and supporter until her death. Financial considerations - the Society's inability to come to what the committee considered satisfactory terms with the management of the Playhouse - dictated a return to the Town Hall in the following year. In the autumn of 1927 came a new departure - a musical comedy, 'Miss Hook of Holland', by Paul Rubens, which proved very popular with the audiences. Financially, the show was a success and £144.0s.0d., the largest sum to that date, was given to charities. Nevertheless, the production was not without its difficulties, for during the Saturday matinee, the town's electricity supply failed and the stage was suddenly plunged into darkness. The chorus continued to sing, clutching candies, but the performance had in the end to be abandoned. Fortunately, the supply was restored in time for the evening performance. 'THE NATIONAL OMNIBUS CO. LTD,' announced the programme, 'will run a Special Service to Letchworth and Norton after each performance. Messrs. FRANKLIN BRIDEN will run a Charabanc from Stevenage each evening at 7 p.m." The next year two productions were given. 'The Geisha', staged in April, proved very popular and a record profit was made. This was followed in the autumn by 'A Country Girl', which was equally well received. Evidently more patrons now travelled by motor-car, for the 'Geisha' programme noted 'FREE GARAGE accommodation for cars is provided in The Cattle Market, next to the Fire Station.' The Society still cherished the Savoy operas, however, and to the delight of most of its members, returned to Gilbert & Sullivan with a production of 'Princess lda' in the spring of 1929. The choice for the autumn was Andr6 Messager's 'Veronique', remembered as the show in which the live donkey stole most of the limelight. Having completely overcome his stage fright, it is reported, he duly came on and took a bouquet of vegetables at the close on Saturday night! 'On account of the length of the Opera', said the programme modestly ,no encores can be given'. In 1930 came another new production, 'Tom Jones', and in 1931 there were repeats of 'The Pirates of Penzance' and 'Merrie England'.